My mom used to have the best garlic corn dog recipe. I’ve asked her & she can’t find it. I remember it was really tasty, thick, and garlicky. So yummy! Thanks – love your newsletter! I have to admit I’ve never tried or even heard of garlic corn dogs. The idea sounds intriguing though. 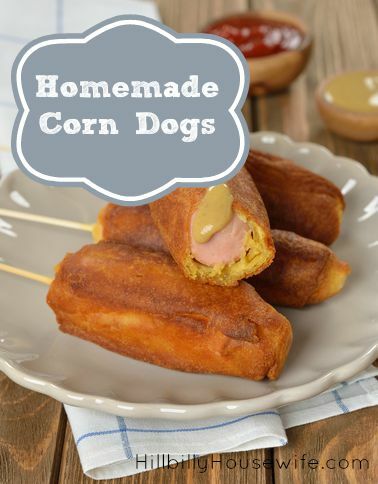 You could probably tweak this corn dog recipe. I would try reducing the sugar to 1 tbsp and adding some garlic salt. Maybe even brush them with a little melted butter when they come out of the fryer and add a little more garlic salt. Let’s see if our wonderful Hillbilly Housewife readers come up with other tips and recipes for you. If you have one to share with Cathy, please leave a comment below. Thanks so much!